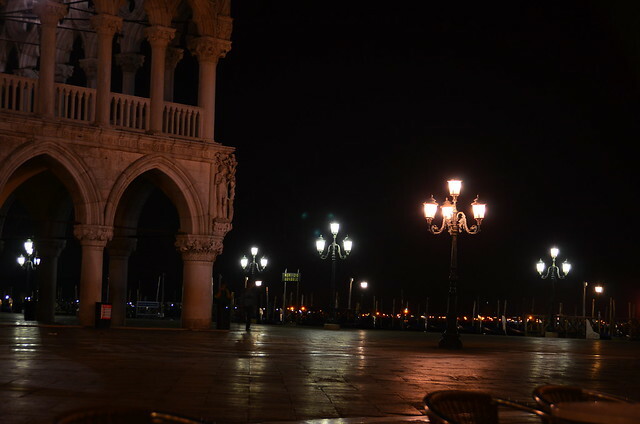 The first time I saw Piazza San Marco was after midnight. 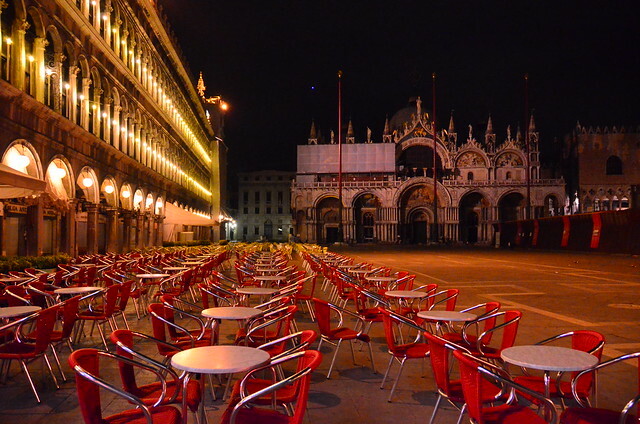 Neat rows of tables and chairs lined up the edges, while the centre of the square was rather deserted. There were a few others enjoying the night at San Marco, but it was nothing compared to the daytime hustle. 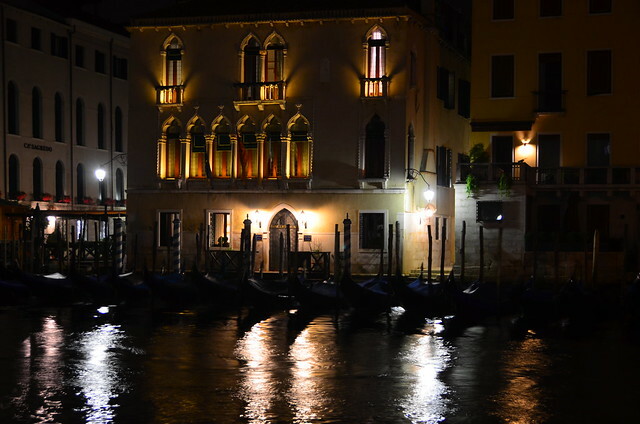 Venice is famous for its canals, Piazza San Marco, Rialto bridge, Murano glass. Yet none of these things fully explain what it is that captivates so many visitors of this city. Let me try to explain it more fully. 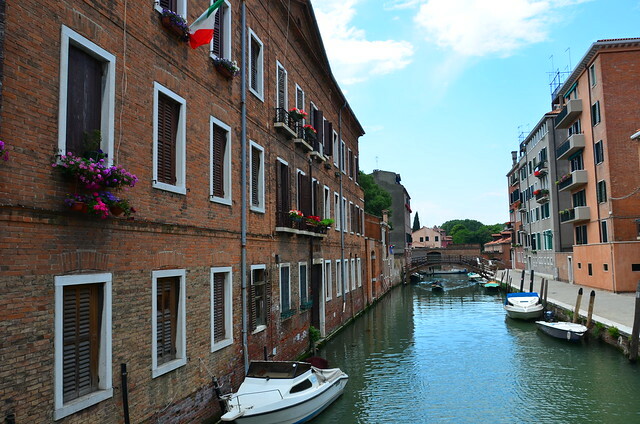 The canals are definitely a big part of what makes Venice so alluring. They are everywhere. 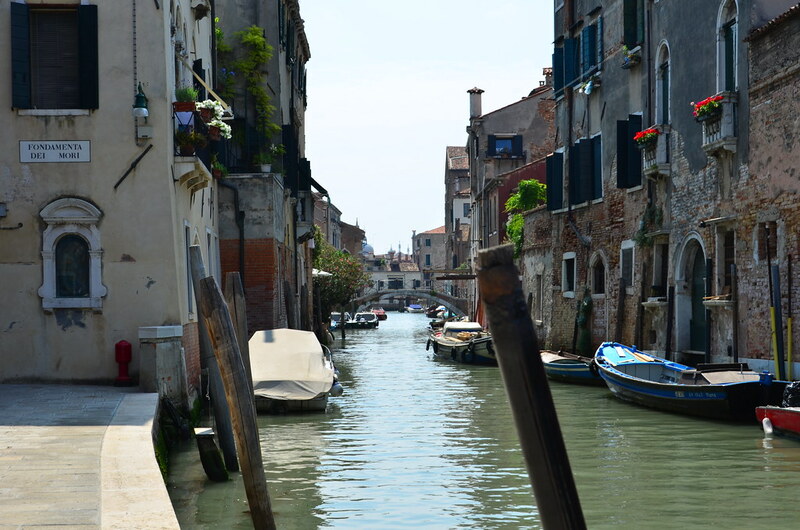 There are no cars in Venice! The place is so small, you can walk to most places within minutes, and given hours you can literally cover it from edge to edge. But if you want to go faster, or visit islands that are not connected to the main one by bridges – you have to take a boat. It sets a completely different pace to your day. Then there is the food. Most of it is rather good. Most is also not cheap, since this is after all a place with more tourists than local residents. There are exceptions though, with quite a few low key places serving pizzas and other snacks that are both delicious and cheap. We found one like that (Arte Della Pizza) in a small alley in Cannaregio. 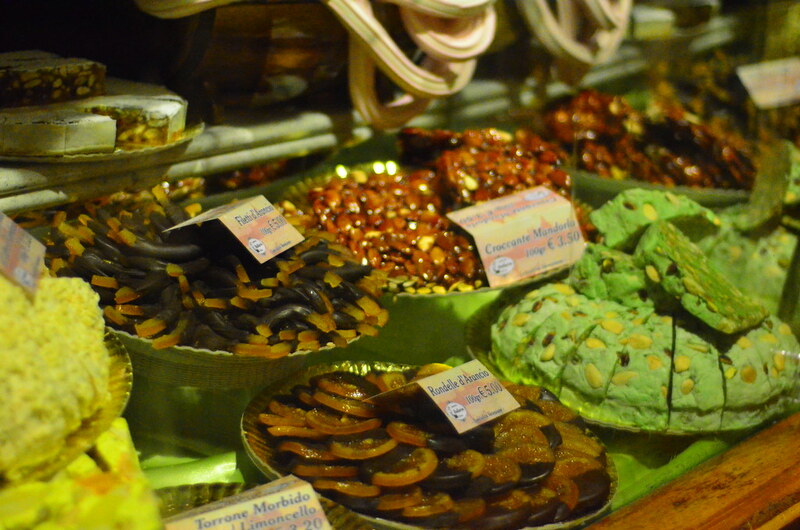 It’s a really tiny place, you can walk by and not see it, but if you’re hungry – you’ll smell it. Then there are the buildings – they really are disintegrating, but it seems that the locals are keeping the repairs up just enough to prevents everything from fully falling apart, while maintaining that romantic decaying look. Then there are the flowers. It appears that a plant is never grown in Venice unless it blossoms. 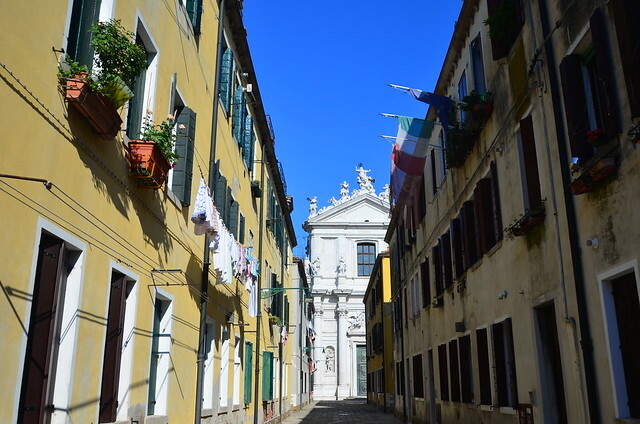 Most windows are decorated by live potted plants, and of the few trees that are in Venice – majority greeted us with flowers. Of course, this would not be the case in December, but meticulous effort by the residents to keep everything beautiful pays off remarkably well. From large scale architecture to the details on the door knobs – it’s a culture of people who care about the little things. It’s the little things that make the large scale Venice what it is. 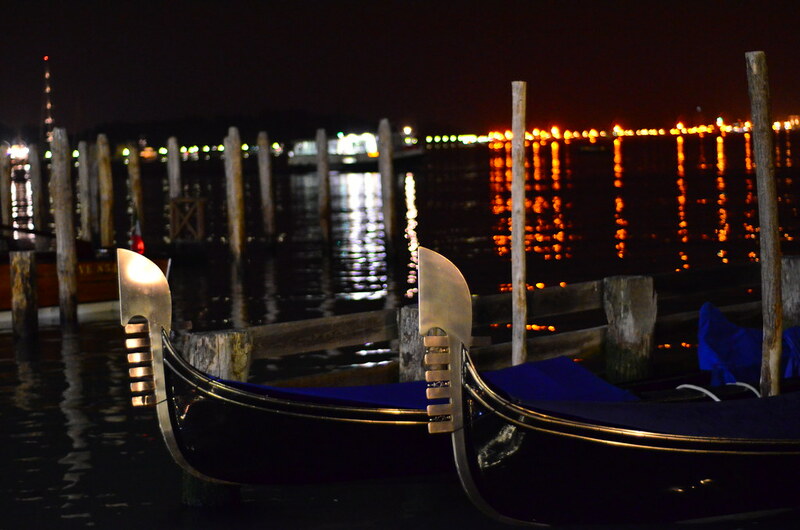 Did not take a gondola ride. It just seemed too touristy of a thing. 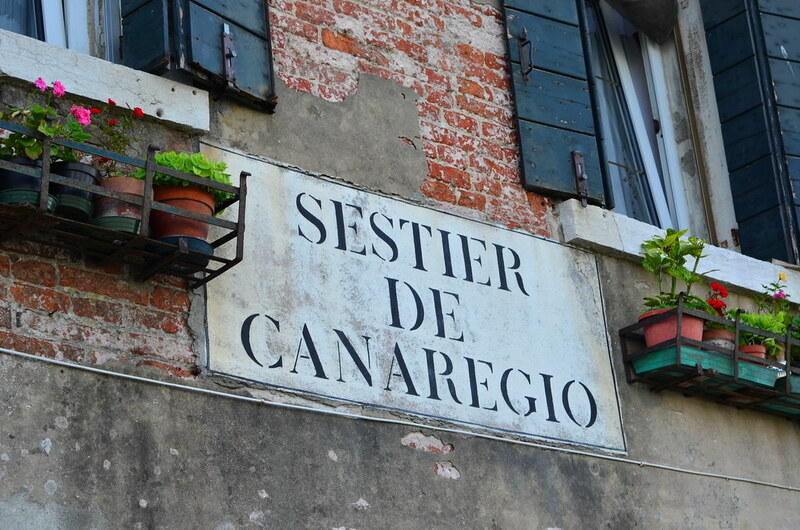 How can you ever get lost in Venice, there are signs everywhere! 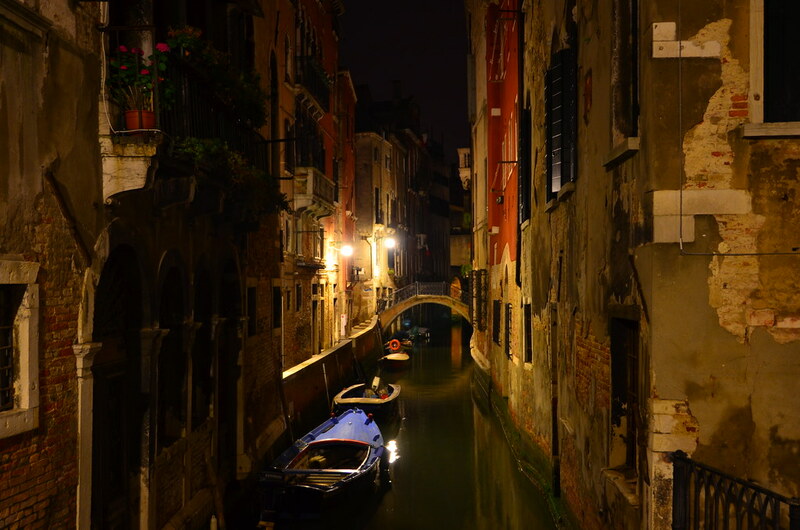 A lot of the small canals look particularly eerie at night. While the city does not completely shut off, the amount of activity going on is just a notch above being considered white noise. 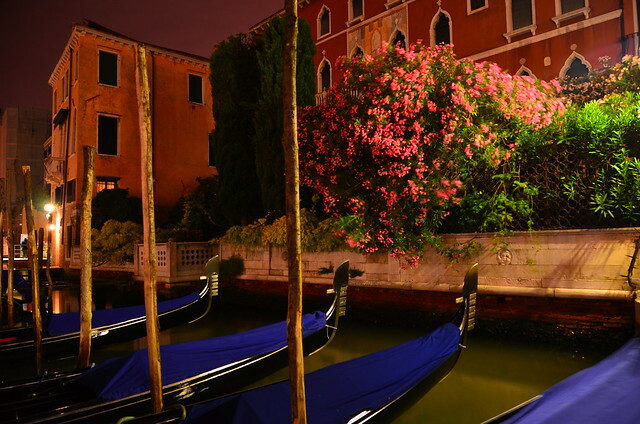 The Grand Canal remain moving throughout the night, with vaporettos sending scheduled waves through the moored gondolas. Going to Lido in the evening became our favourite escape from the constant walking required in the city. Swimming in the Adriatic sea at sunset is incredibly relaxing. 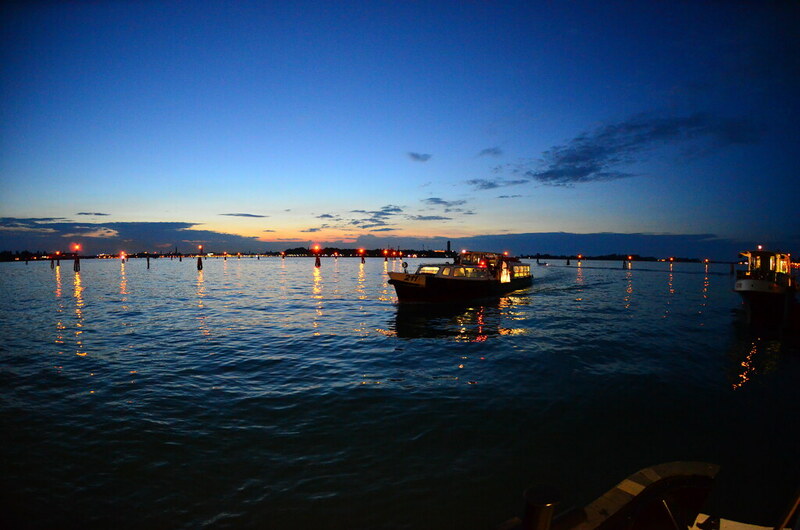 Then once the sun is down, head back to the vaporetto stop and wait for one to come from across the lagoon, and take you home, following strictly between the lit up poles in the water. What you do not realize is that to take this picture one had to stand at the very end of a shaky small pier, holding on to the half rotten pole in the water and trying not to breathe so as to reduce camera shake. Yet another place that it much easier on your brain at night. 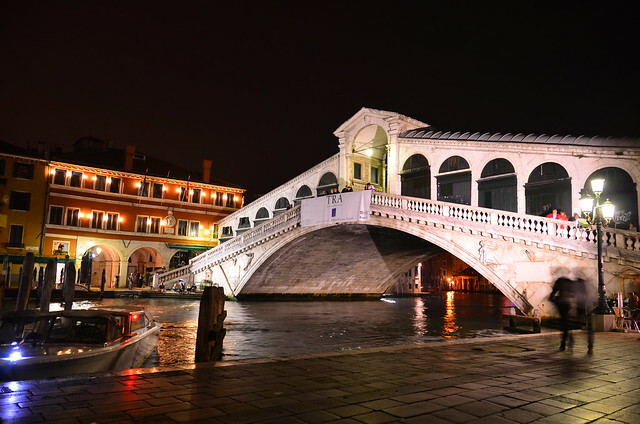 Rialto bridge, filled to about 0.5% capacity. This cat was one of our furry neighbours. 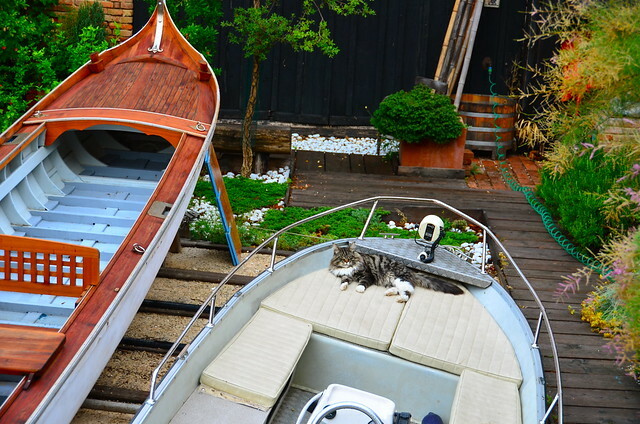 Sometimes we would meet him on a bridge, walking on the edge, sometimes – sunbathing (in his own boat, I’m sure). 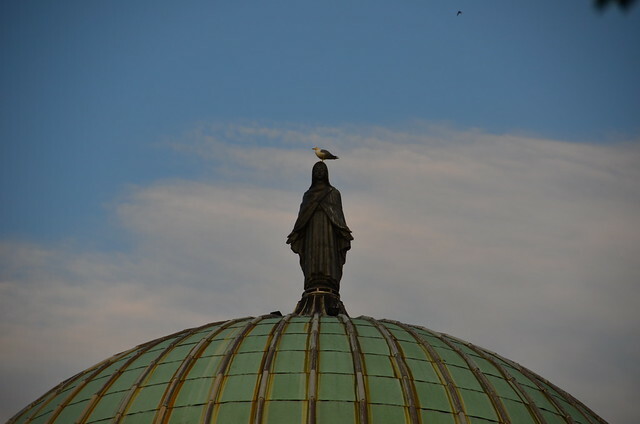 A church top on Lido. A bird sitting on the very top, because it can. 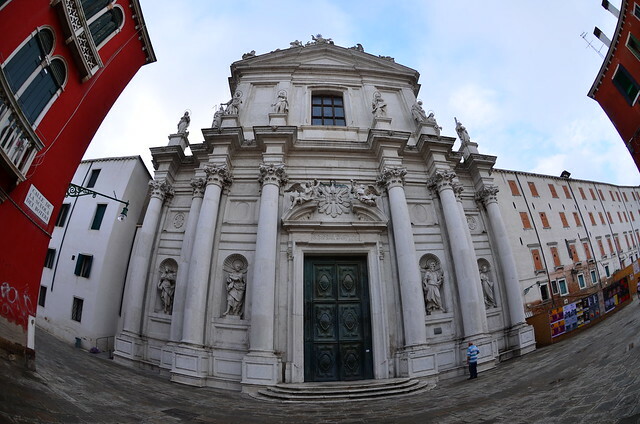 If you turn left here, you will end up on Fondamente Nove. 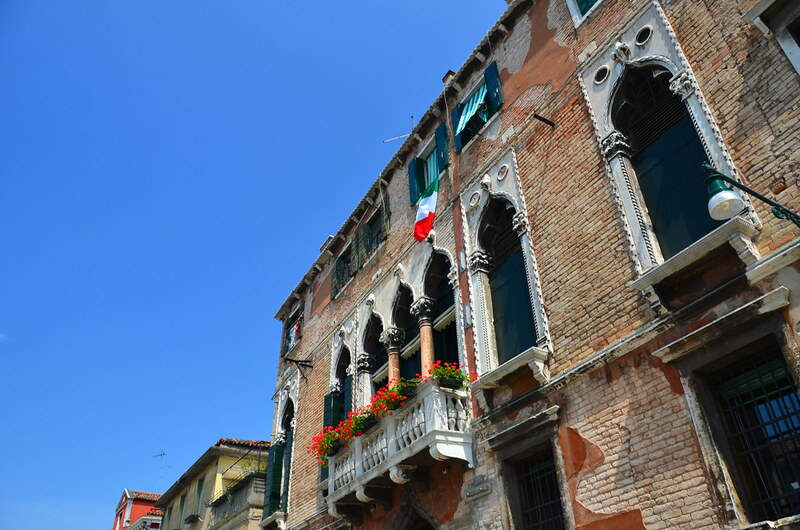 Three types of things hang from Venetian windows: flower pots, flags and laundry. Cats sometimes gaze at you from the windows, but never hang outside, for some reason. The lamp posts are something that I will not forget in a long time. It’s hard to catch the colours at night (I gave up and opted for a black and white shot), but the glass enclosure is a beautiful shade of pink. In most places people would look at you funny if you proposed making the street lights pink. Outside of San Marco the view is dominated by the light coming from the islands across the Giudecca canal and casting long shimmering reflections. Bliss. This was taken around midnight, with all shops already closed. You can look but you cannot touch. Flowers and flags. It is safe to assume there is laundry drying in the windows of the opposite wall. Bridge, canal, boats, buildings, flowers, flags. Many points in the city look similar, but none are quite the same. 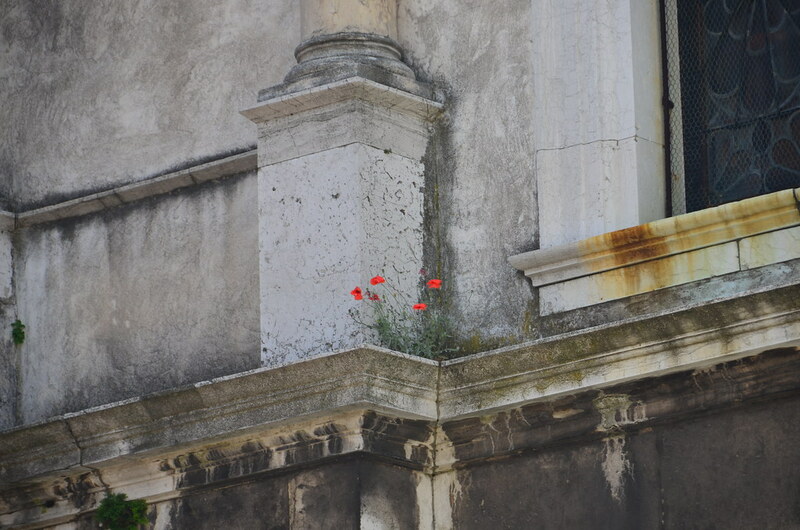 Poppies growing above the second floor of a church. Because they can. 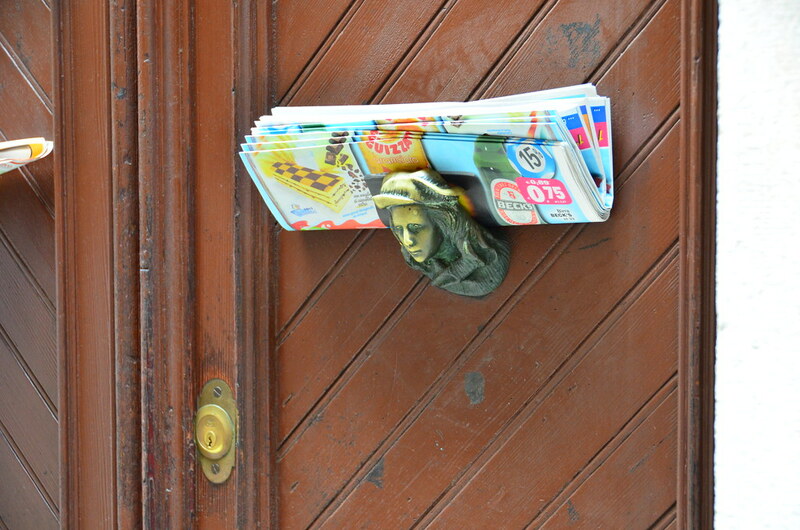 Details in everything, even this spam-holder.